PurposeCardiac PET-MR has shown potential for the comprehensive assessment of coronary heart disease. However, image degradation due to physiological motion remains a challenge that could hinder the adoption of this technology in clinical practice. The purpose of this study was to validate a recently proposed respiratory motion-corrected PET-MR framework for the simultaneous visualisation of myocardial viability (18F-FDG PET) and coronary artery anatomy (coronary MR angiography, CMRA) in patients with chronic total occlusion (CTO).MethodsA cohort of 14 patients was scanned with the proposed PET-CMRA framework. PET and CMRA images were reconstructed with and without the proposed motion correction approach for comparison purposes. Metrics of image quality including visible vessel length and sharpness were obtained for CMRA for both the right and left anterior descending coronary arteries (RCA, LAD), and relative increase in 18F-FDG PET signal after motion correction for standard 17-segment polar maps was computed. Resulting coronary anatomy by CMRA and myocardial integrity by PET were visually compared against X-ray angiography and conventional Late Gadolinium Enhancement (LGE) MRI, respectively.ResultsMotion correction increased CMRA visible vessel length by 49.9% and 32.6% (RCA, LAD) and vessel sharpness by 12.3% and 18.9% (RCA, LAD) on average compared to uncorrected images. Coronary lumen delineation on motion-corrected CMRA images was in good agreement with X-ray angiography findings. For PET, motion correction resulted in an average 8% increase in 18F-FDG signal in the inferior and inferolateral segments of the myocardial wall. An improved delineation of myocardial viability defects and reduced noise in the 18F-FDG PET images was observed, improving correspondence to subendocardial LGE-MRI findings compared to uncorrected images.ConclusionThe feasibility of the PET-CMRA framework for simultaneous cardiac PET-MR imaging in a short and predictable scan time (~11 min) has been demonstrated in 14 patients with CTO. Motion correction increased visible length and sharpness of the coronary arteries by CMRA, and improved delineation of the myocardium by 18F-FDG PET, resulting in good agreement with X-ray angiography and LGE-MRI. Tissue classification as a potential approach for attenuation correction in whole-body PET/MRI: evaluation with PET/CT data. Attenuation correction (AC) of whole-body PET data in combined PET/MRI tomographs is expected to be a technical challenge. In this study, a potential solution based on a segmented attenuation map is proposed and evaluated in clinical PET/CT cases. Segmentation of the attenuation map into 4 classes (background, lungs, fat, and soft tissue) was hypothesized to be sufficient for AC purposes. The segmentation was applied to CT-based attenuation maps from (18)F-FDG PET/CT oncologic examinations of 35 patients with 52 (18)F-FDG-avid lesions in the lungs (n = 15), bones (n = 21), and neck (n = 16). The standardized uptake values (SUVs) of the lesions were determined from PET images reconstructed with nonsegmented and segmented attenuation maps, and an experienced observer interpreted both PET images with no knowledge of the attenuation map status. The feasibility of the method was also evaluated with 2 patients who underwent both PET/CT and MRI. The use of a segmented attenuation map resulted in average SUV changes of 8% +/- 3% (mean +/- SD) for bone lesions, 4% +/- 2% for neck lesions, and 2% +/- 3% for lung lesions. The largest SUV change was 13.1%, for a lesion in the pelvic bone. There were no differences in the clinical interpretations made by the experienced observer with both types of attenuation maps. A segmented attenuation map with 4 classes derived from CT data had only a small effect on the SUVs of (18)F-FDG-avid lesions and did not change the interpretation for any patient. This approach appears to be practical and valid for MRI-based AC. "Soap-Bubble" visualization and quantitative analysis of 3D coronary magnetic resonance angiograms. In order to compare coronary magnetic resonance angiography (MRA) data obtained with different scanning methodologies, adequate visualization and presentation of the coronary MRA data need to be ensured. Furthermore, an objective quantitative comparison between images acquired with different scanning methods is desirable. To address this need, a software tool ("Soap-Bubble") that facilitates visualization and quantitative comparison of 3D volume targeted coronary MRA data was developed. In the present implementation, the user interactively specifies a curved subvolume (enclosed in the 3D coronary MRA data set) that closely encompasses the coronary arterial segments. With a 3D Delaunay triangulation and a parallel projection, this enables the simultaneous display of multiple coronary segments in one 2D representation. For objective quantitative analysis, frequently explored quantitative parameters such as signal-to-noise ratio (SNR); contrast-to-noise ratio (CNR); and vessel length, sharpness, and diameter can be assessed. The present tool supports visualization and objective, quantitative comparisons of coronary MRA data obtained with different scanning methods. The first results obtained in healthy adults and in patients with coronary artery disease are presented. Copyright 2002 Wiley-Liss, Inc. Improved coronary artery definition with T2-weighted, free-breathing, three-dimensional coronary MRA. Three-dimensional (3D) navigator-gated and prospectively corrected free-breathing coronary magnetic resonance angiography (MRA) allows for submillimeter image resolution but suffers from poor contrast between coronary blood and myocardium. Data collected over >100 ms/heart beat are also susceptible to bulk cardiac and respiratory motion. To address these problems, we examined the effect of a T2 preparation prepulse (T2prep) for myocardial suppression and a shortened acquisition window on coronary definition. Eight healthy adult subjects and 5 patients with confirmed coronary artery disease (CAD) underwent free-breathing 3D MRA with and without T2prep and with 120- and 60-ms data-acquisition windows. The T2prep resulted in a 123% (P<0. 001) increase in contrast-to-noise ratio (CNR). Coronary edge definition was improved by 33% (P<0.001). Acquisition window shortening from 120 to 60 ms resulted in better vessel definition (11%; P<0.001). Among patients with CAD, there was a good correspondence with disease. Free-breathing, T2prep, 3D coronary MRA with a shorter acquisition window resulted in improved CNR and better coronary artery definition, allowing the assessment of coronary disease. This approach offers the potential for free-breathing, noninvasive assessment of the major coronary arteries. Effect of myocardial viability assessed by technetium-99m-sestamibi SPECT and fluorine-18-FDG PET on clinical outcome in coronary artery disease. 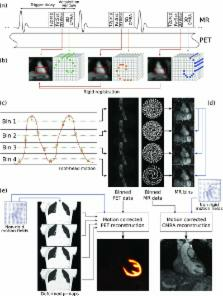 Prospective motion correction for 3D pseudo-continuous arterial spin labeling using an external optical tracking system.